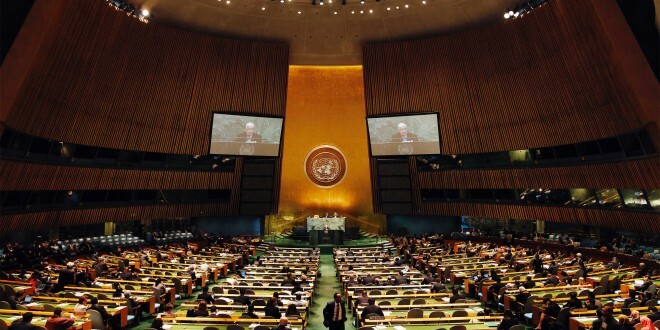 This last Thursday, the United Nations General Assembly (UNGA) adopted a draft resolution entitled “The right of the Palestinian people to self-determination”, and the result of the voting was 177 countries in favor of the Resolution. According to the Resolution, the UNGA confirms the urgent need to end, without delay, the Israeli occupation of the Palestinian Territories and to achieve a peaceful, just, lasting and comprehensive agreement between the Palestinians and Israelis. All of this agreements, according to the UNGA, should be based on the United Nations resolutions, including the principle of land for peace, the Arab Peace Initiative and the road map drawn up by the Quartet. The Resolution also pointed out the conclusion of the International Court of Justice in the advisory opinion of 9 July 2004, that states that the construction of the Apartheid Wall by the Israeli government is one of the main causes that severely impedes the right of the Palestinians to self-determination.